In 1888, the local Con­ference of the St. Vincent de Paul Society established a small mission chapel near the corner of Blair and Virginia in St. Paul, Minnesota. 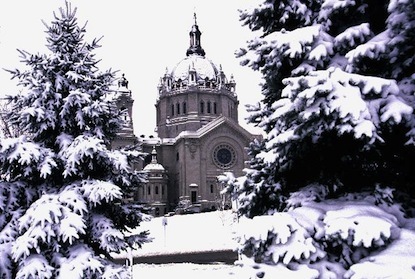 This was the begin­ning of St. Vincent's Parish in the life story of the Catholic Church in the Archdiocese of St. Paul and Minneapolis. 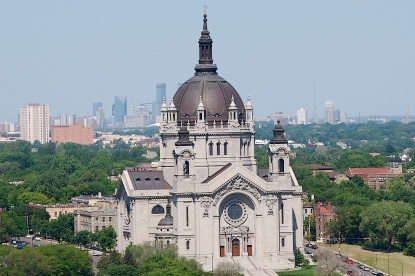 The 125 predominantly Irish families who worshiped in St. Vincent's Chapel were the nucleus of what was to become a vital center of St. Paul's "Frogtown" area. Priests from St. Luke's Parish served the small community. The very year of its founding was the year in which Pope Leo XIII, recognizing the growing importance of St. Paul as a Catholic center in the midwest, granted the diocese metropolitan rank and appointed John Ireland as its first archbishop. The story of St. Vincent de Paul Parish is a story of growth through hard work and sacrifice. Father Raleigh from nearby St. Joseph's Parish offered the first Mass in the newly constructed chapel. Every Sunday the Reverend (later Bishop) John J. Lawler offered Mass in the St. Vincent's Chapel, thus distinguishing him as St. Vincent's first pastor, al­though his pastorate lasted scarcely a year. In October of 1889 the first St. Vincent's Rec­tory was ready for occupancy. Archbishop Ireland ap­pointed a young Irish Priest, the Reverend Laurence Cosgrove, to be St. Vincent's first resident pastor. His pastorate of twenty years was marked by great material and spiritual growth in the parish. Father Cosgrove himself became somewhat of a legend. He was a man of great zeal, energy, and foresight. In addi­tion to being pastor of St. Vincent's, he served as chaplain of Calvary Cemetery, chaplain of the Ancient Order of Hibernians, chaplain of the State Order of Foresters, and first pastor of St. Andrew's Parish, which was founded in 1889 as a mission of St. Vincent's. Father Cosgrove, a scholarly man in literary gifts, in his rare quiet moments wrote and had published a small hardbound volume entitled "A Popular History of St. Vincent's Church." In beauti­fully flowing prose, he records and describes with a wealth of detail. On May 7, 1898 was the formal dedication by Archbishop Ireland of the newly erected St. Vincent de Paul Church. Father Cosgrove wrote, "In 1897 it was found that around the handful of people that eight years before had assembled in a tiny mission chapel there had grown up a large and flourishing congregation for which the church was entirely insufficient." On November 1, 1900 ground was broken for St. Vincent's School. In July 1901, St. Vincent's School, staffed by four Sisters of St. Joseph of Carondelet, opened with an enrollment of 190 children. On September 8, 1902 was the dedication of St. Vincent's School, "an imposing structure three stories high, [standing] in spacious grounds, large enough, after providing ample playground for the children, to afford an enclosed park prettily laid out in greensward and flower beds eight classrooms with a seating capacity of 500, an ornamental fountain in the middle of the playground." Thus Father Cosgrove described the school, the building of which was to him a dream come to reality. The Reverend Patrick O'Brien, the speaker on the occasion of the school's dedication, praised Father Cosgrove for being "a true priest of God." He added, "I would say there ought to be said of him, 'If you want his monument, look around you.'" Father O'Brien made it clear that he referred not only to material buildings, but also to the evidence of spiritual growth: "The new school is his testimony in stone; his latest converts, his testimony in the flesh." Father Cosgrove's pastorate established the groundwork upon which St. Vincent's was built He was followed by the Reverend William Walsh, who served as pastor for two years. Then in 1912 Archbishop Ireland appointed the Reverend Timothy E. Crowley to St. Vincent's. During Father Crowley's ten years at St. Vincent's an addition to the rectory was constructed, and extensive rebuilding of the school became an ur­gent necessity after a very destructive fire. In Sep­tember 1922, Father Crowley was appointed to be the first Rector of Nazareth Hall Preparatory Seminary. Here in his work with future priests he frequently drew upon his fund of knowledge and experience gained during his years as pastor of St. Vincent's parish. In 1922 Archbishop Austin Dowling appointed to St. Vincent's Parish a priest of outstanding personal qualities and of wide experience. The Reverend Martin I. J. Griffin had been & parish assistant, Workhouse Chaplain, secretary to Archbishop Ireland, Treasurer of St. Thomas College, and pastor of St. Cecilia's Parish before his appointment to St. Vincent's. St. Vincent's then numbered 815 families, all of moderate means. The school, staffed by eight Sisters, had an enrollment of 365 students. 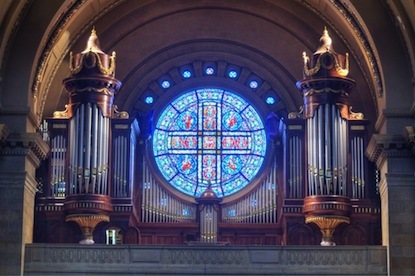 Gertude Kammerer, an eighth grade student at the time, listed the "considerable improvements" made under the direction of Father Griffin when she wrote, "The auditorium in the basement of the church had been completed from new dishes to new walls. In addition to these were new cabinets, a new sink, kitchen utensils, lighting sys­tem, heating system and thirty-two folding tables, which were made by the men of the parish." She went on to exclaim,"The results were simply miraculous. Now we are not ashamed to have even the Pope visit our auditorium." 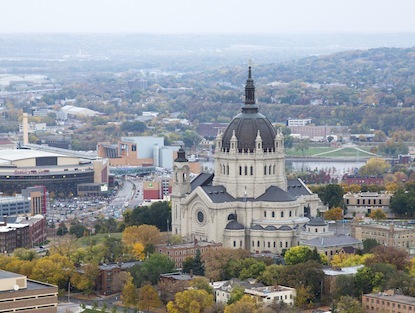 In 1940 Father Griffin accepted an assignment to St. Stephen's Parish in Minneapolis. Here he spent the last five years of his life. Father Griffin was succeeded at St. Vincent's by the Reverend Peter F. During Father Meade's pastorate the "Daily Adoration Society of St. Vincnet's Parish" was established. From June 1943 through June 1951 the Blessed Sacrament was was exposed for daily adoration from 9 a.m. until Benediction at 7:30 p.m. The Reverend Thomas G. Exley came as ad­ministrator to St. Vincent's in June of 1951. People delight in recalling his seemingly unlimited physical energy and his unusual organizational ability. During his brief stay of scarcely a year, he worked with the men of the parish to completely redecorate the church. Part of that project was the installation of the present altar and Communion rail. Father Exley was then determined to direct his energies toward improv­ing the school. The work had just gotten underway when Archbishop Murray asked him to leave his many new friends at St. Vincent's in order to become pastor of St. Peter's Parish in Canby, Minnesota. The Reverend Charles H. Morgan, appointed pastor of St. Vincent's in 1952, proved himself to be very capable of carrying on the work begun by Father Exley. He and a group of hard working, dedicated men of the parish completely redecorated the school. He also managed to find the means to install glass-brick win­dows and to provide modern plastic-top desks in all the classrooms. The exterior of the church also required considerable renovation. Father Morgan, after having consulted with architects, labored over plans for the new church-front exterior entrance, and vestibule. From the beginning St. Vincent's had been a parish of working people. Funds were never abundant. After years of patiently saving a bit here and a bit here, Father Morgan was also able to fulfill his dream of replacing the stations in St. Vincent's Church with a beautifully hand-carved set. 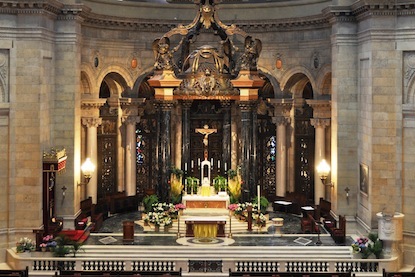 He invited a former member of the parish, Monsignor George E. Ryan, then rector of the Cathedral of St. Paul, to erect the new stations on December 22, 1957. Father Morgan is remembered for his kind, soft-spoken manner and for his obvious enjoyment of the companionship of his people. They looked forward to reading his fine phrases in each Sunday's parish bul­letin, for they knew these words expressed his com­plete sincerity. A critical illness, soon to cause his death, gradually incapacitated Father Morgan, The 75th an­niversary of the founding of St. Vincent's Parish passed by with little notice. No one had any desire to celebrate the diamond jubilee when the pastor was so seriously ill.
After Father Morgan's death in September of 1963, Archbishop Binz requested Reverend Michael P. Fay, then pastor of St. Thomas Parish near LeCentre, Minnesota, to assume the pastorate of St. Vincent's. As a young seminarian, Father Fay had come to the United States from County Mayo, Ireland. Thus in the rapidly changing world of the 1960's, he came to con­tinue the tradition of St. Vincent's Irish pastors, begun back in 1888 by Father Laurence Cosgrove, first resident pastor of the parish. While Father Fay was pastor, Father Lea White, an assistant at the time, was asked to direct and super­vise the painting of the exterior trim of the church. This was done by men of the parish themselves even in­cluding the cross high on the steeple of the church using a boom truck. This work was competed in 1973. Father William Gamber, who served in the U. S. Navy, and afterwards entered the priesthood, was ap­pointed pastor in 1975. The interior of the rectory was repainted under his direction, again with the help of men from the parish. Minor roof repairs to the church were also done during his pastorate. In June of 1979, the long tradition of Irish pas­tors was broken with the appointment of Reverend Ber­nard C. Klein, who was of Austrian and German decent.